Health insurers across the country are dramatically increasing rates and slashing benefits for many of the estimated 17 million consumers with individual insurance policies, while making it almost impossible to obtain affordable alternatives. President Obama and prompted investigations in Sacramento and Washington. Italics mine. Look: if the chief flack for the health insurance industry says the market is broken, then you have to believe that the market is broken. And it won’t fix itself, either. Despite what Republicans pretend to believe when they’re in front of the cameras, the way to correct this isn’t to deregulate further, allowing insurance companies to raise rates even more freely. 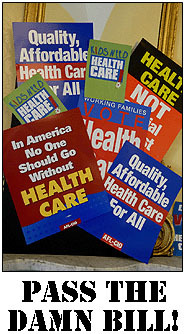 It’s to broaden the insurance pool by mandating guaranteed issue so that no one gets turned down for a policy; enforcing community rating so that everyone pays a fair price; creating an individual mandate so that healthy people can’t game the system by buying insurance only when they get sick; and establishing federal subsidies so that low-income families can afford the premiums. And guess what? That’s what the current bill in Congress does. So let’s pass the Senate bill, agree on a compromise with the House version, and then pass it via reconciliation. It’s good policy, it’s good politics, and the insurance industry, bless its black, greedy little heart, has unexpectedly done an 11-hour face plant and given Democrats all the cover they need. And if conservatives freak out when they finally figure out that Democrats have the stones to pass healthcare reform after all? Let ’em.